This is a quilt we made for our dog groomer whose baby is due any time now! She does such a good job with our rescue dog, Festus! 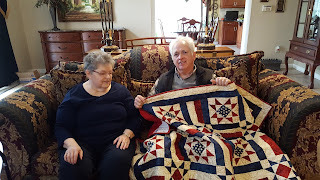 Let quilting help you make someone smile! These are 2 new ones for Project Linus. One is scrappy blue blocks and the other is Yellow Brick Road. Let quilting help you make someone smile. Here is my latest miniature: a kitchen. It was a kit from Robotime. It was fun to do. Let miniatures help you make someone smile! 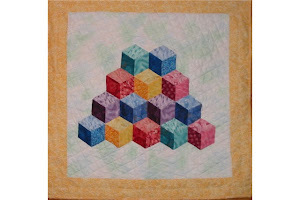 I (should have said "we" because hubby did the quilting!!) made this QOV for my brother, Quentin, who served in the 1960's in Vietnam. He was a heavy construction worker. Here are 2 Yellow Brick Roads Sports quilts. I hope some little boy will live. Hockey and Space Wars. (Maybe that's not a sport, but playing it on the video is!!!!!! LOL!!! This is an embroidery of a teapot that I did to go with my collection of tea and coffee pots. The tray is one I've had since 1987 and had never changed out the cross stitch bunnies that I had in it! The pattern is from Crabapple Hill Studio. Let quilting (embroidery) help you make someone smile. Here are 2 small quilts for Project Linus for someone who likes horses or cowboys. 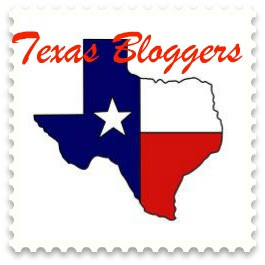 Retired, quilting grandma of four, living in Texas with husband and one very special dog..